Kingsnake.com - Herpforum - Strange WHITE Bullfrog. HELP !!! 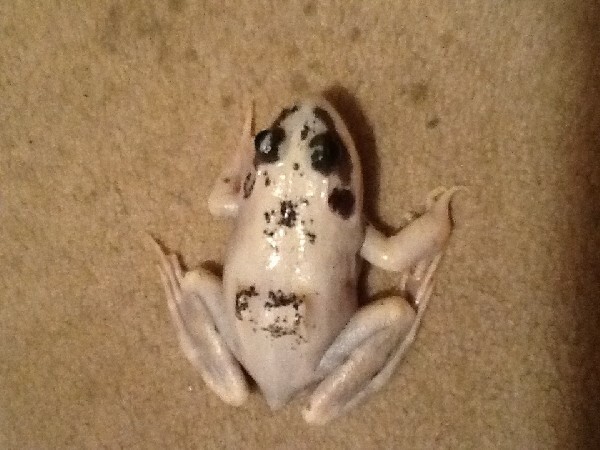 Strange WHITE Bullfrog. HELP !!! Caught this guy at a local pond. He's decent sized, comparable to an average adult hand. I can't believe he survived even this long given he was found in a somewhat small lake/pond filled with common snappers of all sizes... Because, we'll, look at the colors on him. He stands out like a sore thumb. I'm more of a reptile guy, boas, pythons and such. I'm somewhat familiar with morphs and genetics but not so much with amphibians. he strikes me as a leucistic. BUT, his eyes are not pure black. I also can't assume he is albino given his eyes are not pink and to make matters even more confusing he does have splotches of regular-bullfrog-green markings around his head. As far as I can tell his eyes are no different than any other bullfrog color-wise. Can anyone help me out with this guy? Anyone want to take a stab at why 90% of his body is white? Would appreciate it very much, thanks in advance for anyone that can help me out here. P.s. apologies that I only uploaded one picture. I'm used to computers but I am using an I pad right now and I can't figure out how to save other pictures under a different name. When I try to upload the other pics I took of him with this iPad I run into errors because for some reason all the pictures are saved under the same name and I have no idea how to "save as" on this device.